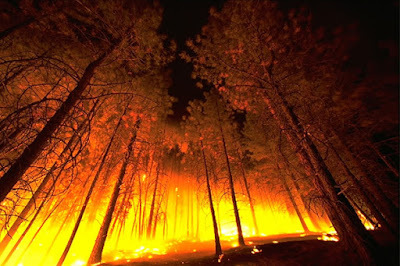 Wildfires like this can send harmful air particles continent-wide. Wikimedia Commons. "For decades, pollution and its harmful effects on people's health, the environment, and the planet have been neglected both by Governments and the international development agenda. Yet, pollution is the largest environmental cause of disease and death in the world today, responsible for an estimated 9 million premature deaths." Story here. RELATED: Please watch my TV newscast, below, which aired some months ago. A segment contained within it references the severe cost of pollution on the world's population.